Fire up your engines and get ready to rumble because VS. 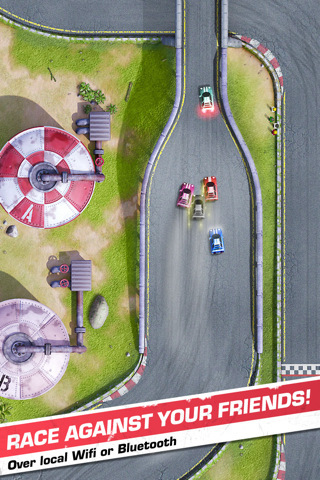 Racing is a charming little racer that brings Hot Wheels style competition to the iPhone. Pared down and simple, this birds-eye view racer feels like the arcade version of slot cars. The emphasis here is on tight turns and smart racing, but the fact that VS. Racing is executed so well gives it all its appeal. 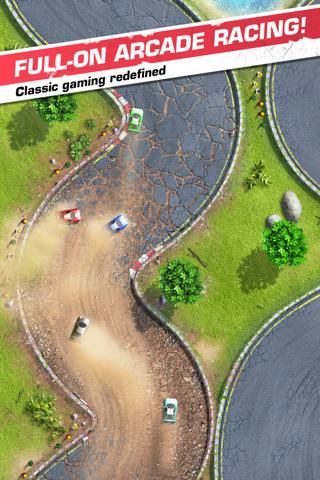 Players can choose to tear across turns with either a traditional on screen joystick (which can be switched from one side of the iPhone screen to the other with a single touch) or through tilt motion. Both options are perfectly responsive, which is great for players who want to feel like they’re rolling with a Wii-style controller or anyone who’s anxious to play one more game while lying down in bed. VS. Racing also gives users the option between a computer and local mode. The computer mode puts players in the racing uniform of Ryan, an aspiring World Champion who is 34 wins away from winning it all. The first time players open the app only one race is unlocked, but drivers can win access to additional races by winning gold, silver or bronze on the preceding level. Computer mode takes players through a simple story that includes a legacy, a hot headed opponent named Darryl, and a hot female pit boss that makes Ryan’s heart throb. Players not interested in the story can skip over the dialogue easily, but the added humor makes for a nice added touch in VS. Racing. Local player mode lets you play against other racers on the same WiFi network. This isn’t as good as games like Words with Friends that let gamers play with anyone anywhere, but if you’re lucky enough to get in the same room with another driver, there’s nothing like the in person experience of leaving a friend in the dust or watching as they pass you for a last second first place finish. The local player mode is especially compelling for the crashes that send your iPhone vibrating and the snapshot finishes, but really the appeal here is the almost comical medium range speed of your car as it tears around the turns. Plus, the accurate controls of VS. Racing lets drivers clothesline other cars into crashing, which can change the game entirely. All said and done VS. Racing is a real gem, but with only six different track layouts and a single fire option in the race settings before each race, there aren’t many features to write home about. The developers at MD Labs have done an excellent job with occasional sand traps that slow your car down significantly and as a gamer I only want more. More tracks with more obstacles, more special options, more car choices, and most of all, more time to lose the night playing VS. Racing with friends. Bottom Line: VS. Racing is a wonderfully endearing classic racer with lots of great appeal. A few more tracks and a bit more variety could move the needle on this game from very good to great before a Porsche can go 0 to 60.